The 1979 mayoral election was held to elect the mayor of San Francisco. Incumbent mayor Dianne Feinstein, who had succeeded George Moscone after his assassination the prior year, was elected to her first full term as mayor of the City and County, the first woman to be elected to the position in the city's history. Feinstein, with (46.63%) was tied in the November 6 election with Quentin L. Kopp (44.72%), both of whom beat out musician Jello Biafra, Sylvia Weinstein, Cesar Ascarrunz, Steve L. Calitri, Tibor Uskert, Joe Hughes and Patricia Dolbeare.Feinstein and Kopp participated in the December 11 runoff, in which Feinstein won with 53.96% over Kopp's 46.04%. Feinstein was sworn into office on January 1, 1980. The 1983 mayoral election was held to elect the mayor of San Francisco. Incumbent Dianne Feinstein, who had previously been subjected to a failed recall election on April 26 (winning with an 83-percent-favorable vote), was re-elected to her second and final term as mayor. Feinstein, winning with 79.62%, defeated Cesar Ascarrunz, Gloria E. La Riva, Pat Wright, Brian Lantz, and Carrie Drake. The 1987 mayoral election was held to elect the 39th mayor of San Francisco. Dianne Feinstein, then the incumbent, had served as mayor since the 1978 assassination of mayor George Moscone and supervisor Harvey Milk and had been elected to full terms in 1979 and 1983, and was thus term-limited. Then-California State Assembly member Art Agnos came from behind to defeat Supervisor John Molinari, garnering 70 percent of the vote. The 1990 California gubernatorial election was held on November 6, 1990. The Republican nominee, Senator Pete Wilson, defeated the Democratic nominee, former San Francisco Mayor Dianne Feinstein, who would later go on to win Wilson's Senate seat. Feinstein won the Democratic nomination against opponents including California Attorney General John Van De Kamp, while Wilson faced minimal opposition in his bid for the Republican nomination. The 1992 United States Senate special election in California took place on November 3, 1992, at the same time as the regular election to the United States Senate in California. Both of California's Senators were elected for the first time. This is not a unique occurrence; it would happen again in Tennessee in 1994 and in Kansas in 1996. The seat became vacant after incumbent Republican U.S. Senator Pete Wilson won the 1990 gubernatorial election, defeating Democrat Dianne Feinstein. Wilson appointed John F. Seymour to the Senate to replace himself. In this special election held simultaneously with the regularly Senate election for the state's Class 3 Senate seat, Feinstein defeated Seymour to serve the remaining 2 years of the term. Feinstein subsequently held seniority over fellow Democrat Barbara Boxer, elected on the same day; because Feinstein was elected to complete an existing term, she took office on November 10, only 7 days after the election, while Boxer's term commenced with the beginning of the next session of Congress in January 1993. The 1994 United States Senate election in California was held November 8, 1994. Incumbent Democratic U.S. Senator Dianne Feinstein won re-election to her first full term. The 2000 U.S. Senate election in California was held on November 7, 2000. Incumbent Democratic U.S. Senator Dianne Feinstein won re-election to her second full term. The 2006 United States Senate election in California was held November 7, 2006. Incumbent Democratic U.S. Senator Dianne Feinstein won re-election to her third full term. The 2012 United States Senate election in California took place on November 6, 2012, concurrently with the 2012 U.S. presidential election as well as other elections to the United States Senate and House of Representatives and various state and local elections. The primary election on June 5 took place under California's new blanket primary law, where all candidates appear on the same ballot, regardless of party. In the primary, voters voted for any candidate listed, or write-in any other candidate. The top two finishers—regardless of party—advanced to the general election in November, even if a candidate managed to receive a majority of the votes cast in the June primary. In the primary, less than 15% of the total 2010 census population voted. Incumbent Democratic U.S. Senator Dianne Feinstein announced her intention to run for a fourth full term in April 2011 and finished first in the blanket primary with 49.5% of the vote. The second-place finisher was Republican candidate and autism activist Elizabeth Emken, who won 12.7% of the vote. Feinstein and Emken contested the general election on November 6, with Feinstein winning re-election in a landslide, by 62.5% to 37.5%. This is the most recent US Senate election in California in which a Republican advanced to the general election. The next regularly scheduled election in which a Republican could advance to the general election will occur in 2022. The 2018 United States Senate election in California took place on November 6, 2018, to elect a member of the United States Senate to represent the State of California, concurrently with other elections to the United States Senate, elections to the United States House of Representatives, and various state and local elections. Under California's non-partisan blanket primary law, all candidates appear on the same ballot, regardless of party. In the primary, voters may vote for any candidate, regardless of their party affiliation. In the California system, the top two finishers—regardless of party—advance to the general election in November, even if a candidate receives a majority of the votes cast in the primary election. Washington and Louisiana have similar "jungle primary" style processes for U.S. Senate elections, as does Mississippi for U.S. Senate special elections. The candidate filing deadline was March 8, 2018 and the primary election was held on June 5, 2018.Four-term Democratic incumbent Dianne Feinstein won reelection in 2012 with 63% of the vote, taking the record for the most popular votes in any U.S. Senate election in history with 7.86 million votes. Feinstein is the ranking member of the Senate Judiciary Committee. She turned 85 years old in 2018, leading to speculation that she would retire in January 2019, as her long-time colleague Barbara Boxer did in January 2017. However, Feinstein stood for reelection for her fifth consecutive term, winning 44.2% of the vote in the top-two primary; she faced Democratic challenger Kevin De León in the general election, who won 12.1% of the primary vote. For the second time since direct elections to the Senate began after the passage of the Seventeenth Amendment in 1913, no Republican appeared on the general election ballot for U.S. Senate in California. The highest Republican finisher in the primary won only 8.3 percent of the vote, and the 10 Republicans only won 31.2 percent of the vote between them. In the general election, Feinstein defeated De León with 54% of the vote to De León's 46%. The Congressional-Executive Commission on China (CECC) is an independent agency of the U.S. government which monitors human rights and rule of law developments in the People's Republic of China. It was created in October 2001 under Title III of H.R. 4444, which authorizes normal trade relations with the PRC, and establishes a framework for relations between the two countries. The commission was given the mandate by the U.S. Congress to monitor and report on human rights issues with a particular focus on compliance with the International Covenant on Civil and Political Rights and the Universal Declaration of Human Rights. Its reporting covers developments in freedom of expression, the right to peaceful assembly, religious freedom, freedom of movement, freedom from arbitrary arrest, detention, or torture, and the right to a fair trial, among others. The commission publishes an annual report to the President of the United States and Congress, typically in the fall of each year. It also maintains a database of prisoners of conscience, and holds regular roundtables and hearings.The commission comprises a staff of researchers and analysts, and is overseen by as many as nine members each from the U.S. Senate and House of Representatives, as well as senior executive branch officials. Chairmanship of the commission rotates between the majority parties from the House and Senate. The commission is currently chaired by Christopher Smith (R-NJ). The electoral history of Dianne Feinstein. Feinstein previously served as a member of the San Francisco Board of Supervisors, Mayor of San Francisco, and is an incumbent United States Senator. John Francis Seymour Jr. (born December 3, 1937) is a retired American politician who served as a United States Senator from California from 1991 to 1992. A member of the Republican Party, he was appointed to continue Pete Wilson's term but lost the special election to finish it to Democratic candidate and former San Francisco Mayor Dianne Feinstein. California elects United States Senators to Class 1 and Class 3. The state has been represented by 44 people in the Senate since it was admitted to the Union on September 9, 1850. Its current U.S. Senators are Democrats Dianne Feinstein and Kamala Harris. United States President, businessman, and television personality Donald Trump became widely known during the 2016 United States presidential election and his subsequent presidency for using nicknames to criticize foreign leaders, media figures, and politicians. His use of nicknames has been characterized as bullying by various media outlets.Nicknames predating the campaign that Trump appropriated are indicated by footnotes. 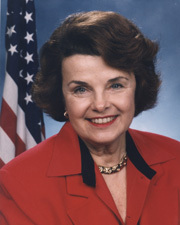 Dianne Feinstein became mayor pro-tem of the City and County of San Francisco, California on December 4, 1978, following the Moscone–Milk assassinations in which her predecessor in office, George Moscone and fellow member of the San Francisco Board of Supervisors, Harvey Milk, were assassinated by former supervisor Dan White. At the age of 45, Feinstein became the first female mayor of the municipality, and was formally elected to the position on November 4, 1979 and re-elected in 1983. She was prevented from seeking a third term in office and was succeeded in 1987 by Art Agnos. Richard Charles Blum (born July 31, 1935) is an American investment banker and husband of United States Senator Dianne Feinstein. He is the chairman and president of Blum Capital, an equity investment management firm that acts as general partner for various investment partnerships and provides investment advisory services. Blum also serves in various boards of directors of several companies, including CB Richard Ellis, where until May 2009 he served as the chairman of that board. He has been a regent of the University of California since 2002. The Superior Court of California of the County of San Francisco is a branch of the California Superior Court with jurisdiction over the City and County of San Francisco. Katherine Feinstein (daughter of Senator Dianne Feinstein) had been the presiding judge of the court for twelve years, through 2012. Judge Cynthia Ming-Mei Lee was elected the new presiding judge on June 27, 2012. The court is composed of 52 judges and twelve commissioners. The court currently has two commissioners.In 1976 the Court helped to create the San Francisco Pretrial Diversion Project, a nonprofit organization that helps to provide alternative punishments for misdemeanors and parking violations, in an attempt to divert petty offenders from overcrowded courtrooms.In December 2016, John Stewart, chief judge at the court, discarded 66,000 arrest warrants for criminal infractions, like sleeping on the sidewalk, public urination and public drunkenness, stating "You're putting somebody in jail because they're poor and can't pay a fine. We got a lot of criticism, but we thought it was the right thing to do."